In the Mind Matters column, titled “Mood disorders” published in the Horizon, the supplement with today’s The Assam Tribune, Editor-in-Chief of the Open Journal of Psychiatry & Allied Sciences (OJPAS®), Shyamanta Das wrote about “A case report on very late onset mania” by Manjunadh Muraleedharan, Sunil Suthar, and Bhupendra Singh from the current issue of the journal (July-December 2017, Volume 8 Issue 2). Bornali Das, Secretary of the Society for Mental Health in LAMIC (SoMHiL) wrote on “Meaningful relationships” in today’s Horizon, the supplement with The Assam Tribune. “Liaison psychiatry” is the title of this fortnight’s Mind Matters column of Shyamanta Das, Editor-in-Chief of the Open Journal of Psychiatry & Allied Sciences (OJPAS®) published in the Horizon, the supplement with The Assam Tribune. The column discusses the original research paper, titled “Clinical and demographical profile of inpatient psychiatry referrals in a multispecialty teaching hospital” by Vijay Niranjan and Bharat Udey from the current issue (July-December 2017, Volume 8 Issue 2) of OJPAS®. “Occupational stress” is the title of this fortnight’s Mind Matters column of Shyamanta Das, the Editor-in-Chief of the Open Journal of Psychiatry & Allied Sciences (OJPAS®), published in Horizon, the supplement with The Assam Tribune. The column talks about the International Institute of Organisational Psychological Medicine (IIOPM) and its Dean and Executive Director Global Professor Russell Franco D’Souza joining the Editorial Board of OJPAS®. It also discusses the original research paper, titled “Occupational stress among police personnel in India” by G Ragesh, Harish M Tharayil, Meharoof Raj TP, Mariamma Philip, and Ameer Hamza, and published in the current issue (July-December 2017, Volume 8 Issue 2) of OJPAS®. This fortnight’s Mind Matters column of Shyamanta Das, Editor of the Open Journal of Psychiatry & Allied Sciences (OJPAS®) in Horizon of The Assam Tribune, titled “Cognitive function” highlights the original research paper, “Cognitive dysfunction in urban elderly people: an exploratory study using neuropsychological and neuroimaging perspective” by Sreerupa Ghose, Sanjukta Das, and Anup Sadhu, published in OJPAS®. In today’s (Friday 2 June 2017) Horizon, the supplement with The Assam Tribune, Dr Bornali Das, the Secretary of the Society for Mental Health in LAMIC (SoMHiL) wrote about autism in the article titled, “Dealing with autism”. Dr Bornali also authored the full length article on autism, titled “Impact of stress, coping, social support, and resilience of families having children with autism: a North East India-based study” published in the Asian Journal of Psychiatry. RNI E-Filing for Annual Statement in respect of newspaper entitled OPEN JOURNAL OF PSYCHIATRY & ALLIED SCIENCES for the period ending 31st March 2017 is done. This Friday’s (26 may 2017) Mind Matters column of Shyamanta Das, Editor of the Open Journal of Psychiatry & Allied Sciences (OJPAS ), titled “Morbid jealousy” in Horizon, the supplement with The Assam Tribune discusses the Original Research Paper, “Phenomenology and predisposing factors of morbid jealousy in a psychiatric outdoor: a cross-sectional, descriptive study” by Satyajeet Kumar Singh, Samrat Singh Bhandari, and Pramod Kumar Singh, and published advance online in OJPAS . The Original Research Paper, titled “Predictors of involuntary hospitalisation of patients suffering from schizophrenia” by Ivana Stasevic Karlicic, Milena Stasevic, Igor Grbic, Slobodan Jankovic, Zoran Bukumiric, and Slavica Djukic Dejanovic, and published in the Open Journal of Psychiatry & Allied Sciences (OJPAS ) as Advance Online Publication is discussed by Shyamanta Das, the Editor of OJPAS in his Mind Matters column published in today’s Horizon, the supplement with The Assam Tribune, titled “Involuntary hospitalisation“. In today’s (Friday 28 April 2017) Horizon, the supplement with The Assam Tribune, Shyamanta Das wrote about the Editorial of the Open Journal of Psychiatry & Allied Sciences (OJPAS ), titled “Global psychiatry: a LAMIC perspective” in his Mind Matters column by the same title wherein the ‘nouveau’ approach of the journal is highlighted. The final version of the article, titled “Impact of stress, coping, social support, and resilience of families having children with autism: a North East India-based study” with full bibliographic details is now available online, providing free access to the article, and is valid for 50 days, until June 07, 2017. Anyone who clicks on the following link until June 07, 2017, will be taken to the final version of the article on ScienceDirect for free. No sign up or registration is needed – just click and read! Astitva, a multispeciality centre for holistic intervention is situated in Guwahati. Among the different services offered, one is management of children with autism spectrum disorder (ASD). A research work was carried out among the parents of those children attending the centre. The work was presented as poster during the 22nd World Congress of the World Association of Social Psychiatry (WASP 2016) held in The Ashok, New Delhi from 30 November to 4 December by Bornali Das (Secretary of the Society for Mental Health in LAMIC [SoMHiL]), Kakoli Nath (Audiologist and Speech Language Pathologist as well as Founder of Astitva), and Shyamanta Das (Editor of the Open Journal of Psychiatry & Allied Sciences [OJPAS ]). That research is published online on 29 March 2017 in the Asian Journal of Psychiatry (http://dx.doi.org/10.1016/j.ajp.2017.03.040) as full-length paper, titled “Impact of stress, coping, social support, and resilience of families having children with autism: A North East India-based study” by Shyamanta Das, Bornali Das, Kakoli Nath, Arunima Dutta (Editorial Assistant of OJPAS ), Priyanka Bora, and Mythili Hazarika (President of SoMHiL). In today’s Horizon, the supplement with The Assam Tribune, Shyamanta Das wrote about the research paper in his fortnightly Mind Matters’ column, titled “Autism and Northeast India”. The World Health Organization (WHO) released a Newsletter covering the “Depression: Let’s Talk on World Health Day 2017 in Guwahati, Assam” event. The “Depression: Let’s Talk on World Health Day 2017 in Guwahati, Assam” Event is covered in the print media, namely The Assam Tribune titled “Discussion on depression held”. The Editorial of the same day is titled “Mental health”. Shyamanta Das, Editor of the Open Journal of Psychiatry & Allied Sciences (OJPAS ) wrote about the case report, titled “Psychotherapeutic management of hypochondriasis: a case study” that is published advance online in OJPAS in his Mind Matters column, “Hypochondriasis and psychotherapy” of this fortnight’s Horizon, the supplement with The Assam Tribune. Full-length paper, titled “Impact of stress, coping, social support, and resilience of families having children with autism: A North East India-based study” by Shyamanta Das (Editor of the Open Journal of Psychiatry & Allied Sciences [OJPAS ]), Bornali Das (Secretary of the Society for Mental Health in LAMIC [SoMHiL]), Kakoli Nath (Founder of the Astitva), Arunima Dutta (Editorial Assistant of OJPAS ), Priyanka Bora, and Mythili Hazarika (President of SoMHiL) is published online on 29 March 2017 in the Asian Journal of Psychiatry (http://dx.doi.org/10.1016/j.ajp.2017.03.040). In today’s Horizon, the supplement with The Assam Tribune, Shyamanta Das, Editor of the Open Journal of Psychiatry & Allied Sciences (OJPAS ), in his Mind Matters column, titled “Pilot study on burnout” discussed the original article, “Degree of burnout among emergency healthcare workers and factors influencing level of burnout: a pilot study” published in the Delhi Psychiatry Journal. Titled “Burnout and healthcare workers”, this fortnight’s Mind Matters column of Shyamanta Das, MD in Horizon, the supplement with The Assam Tribune talks about the study protocol developed in the Emergency Department of the Gauhati Medical College Hospital, Guwahati and published in the Journal of Evolution of Medical and Dental Sciences. Shyamanta Das, MD wrote on “Love and ‘Addiction’” in Xahitya.Org, an online vernacular (Assamese) language magazine as well as mouthpiece of Bhaxa Xahitya Xanmilani, Axom. Today’s (Friday 17 February 2017) Mind Matters column of Shyamanta Das, MD in Horizon, the supplement with The Assam Tribune, titled “SoMHiL: an ECHO initiative” talks about the Society that strives to promote behavioural science in the Low And Middle Income Countries (LAMIC). 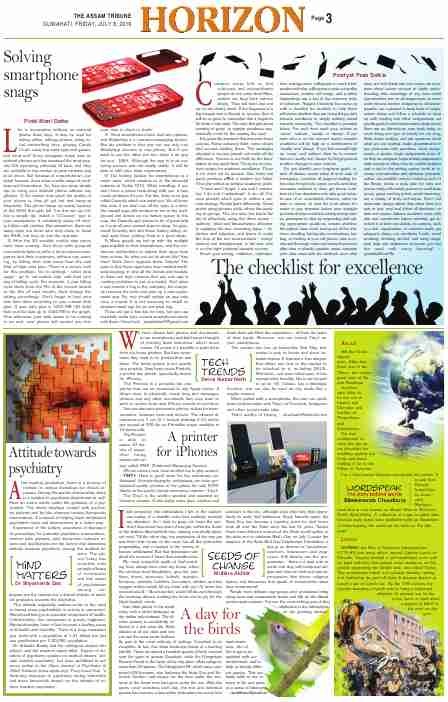 Shyamanta Das, MD wrote about psychiatry-related research publications in journals from low and middle income countries (LAMIC) in his fortnightly Mind Matters column, titled “LAMIC and psychiatric literature” published in Horizon, the supplement with today’s (Friday 3 February 2017) The Assam Tribune. The new issue (January-June 2017, Volume 8 Issue 1) of the Open Journal of Psychiatry & Allied Sciences (OJPAS ) is now in the ResearchBib. The new issue (January-June 2017, Volume 8 Issue 1) of the Open Journal of Psychiatry & Allied Sciences (OJPAS ) is now in the Google Scholar Citations. The new issue (January-June 2017, Volume 8 Issue 1) of the Open Journal of Psychiatry & Allied Sciences (OJPAS ) is now in the Directory of Open Access Journals (DOAJ). The new issue (January-June 2017, Volume 8 Issue 1) of the Open Journal of Psychiatry & Allied Sciences (OJPAS ) is now in the IndianJournals.com with Digital Object Identifier (10.5958/2394-2061). The January-June 2017, Volume 8 Issue 1 of the Open Journal of Psychiatry & Allied Sciences (OJPAS ) is released. “A case report of schizophrenia with severe disability: an eclectic family therapy approach” by Dr. Bornali Das and Dr. Shamiul Akhtar Borbora, published advance online in the Open Journal of Psychiatry & Allied Sciences (OJPAS ) is discussed by the Editor-in-Chief, Shyamanta Das, MD in his Mind Matters column of Horizon, the supplement with today’s (Friday 23 December 2016) The Assam Tribune, titled “Mental illness and family“. In the Mind Matters column, titled “Autism and Asia” of this Friday’s (9 December 2016) Horizon, the supplement with The Assam Tribune, the Editor-in-Chief of the Open Journal of Psychiatry & Allied Sciences (OJPAS ), Shyamanta Das wrote about the Guest Editorial, “About some difficulties in the epidemiological studies of autism” by Leslie Marneau, published advance online in the OJPAS . Titled “Intellectual disability and caregivers”, the Mind Matters column of Shyamanta Das, Editor-in-Chief of the Open Journal of Psychiatry & Allied Sciences (OJPAS ) in today’s (Friday 25 November 2016) The Assam Tribune, reviewed the original research paper, “Anxiety, depression, and quality of life in mothers of children with intellectual disability” by Ritu Raj Gogoi, Ranjan Kumar, and Sonia Pereira Deuri that is published advance online in OJPAS . Shyamanta Das, Editor-in-Chief of the Open Journal of Psychiatry & Allied Sciences (OJPAS ), in his Mind Matters column in Horizon, the supplement with today’s (Friday 11 November 2016) The Assam Tribune, titled “Children and parental alcohol use” wrote about the paper “Children of persons with alcohol dependence syndrome: risks and resilience, theories and interventions” by Mutharaju Arelingaiah, R Dhanasekara Pandian, and E Sinu that is published advance online in OJPAS . In his Mind Matters column of Horizon, the supplement with today’s, Friday the 28 October 2016, The Assam Tribune, titled “Children of alcoholics” Shyamanta Das, Editor-in-Chief of the Open Journal of Psychiatry & Allied Sciences (OJPAS ) wrote about the research paper, “A comparative study on behavioural problems in children of alcohol dependent parents” by Harsh Raj, Krishan Kumar, Vinod Kumar Sinha, and Rajeev Dogra and published in Dysphrenia, the earlier name of the journal. In Horizon, the supplement with The Assam Tribune, dated Friday 14 October 2016, Shyamanta Das, Editor-in-Chief of the Open Journal of Psychiatry & Allied Sciences (OJPAS ) in his Mind Matters column, “Barriers in psychiatry” reviewed the article, “Barriers in the treatment of psychiatric disorders” by Anil Kumar and HR Phookun published in OJPAS . In Horizon, the supplement with The Assam Tribune, dated Friday 30 September 2016, Shyamanta Das, Editor-in-Chief of the Open Journal of Psychiatry & Allied Sciences (OJPAS ) in his Mind Matters column, “Women and mental health” wrote about the Guest Editorial by same title of Unaiza Niaz published in OJPAS . Shyamanta Das, the Editor-in-Chief of the Open Journal of Psychiatry & Allied Sciences (OJPAS ) featured in the English Weekly, G plus VOLUME 3 | ISSUE 48 SEP 24 – SEP 30, 2016 page 9. The Scientific Update is an ISBN publication (978-93-85063-18-3) published by Academy Publisher in association with BOOKBELL on behalf of Organising Secretary, 26th Annual Conference, Indian Psychiatric Society, Assam State Branch, Deptt. Psychiatry, Silchar Medical College & Hospital, Silchar-788014, Assam, India. The editors were Rajeeb Dey, Shyamanta Das, Simanta Talukdar, and Pranjal Dey. It contained an article, “Magnetism and the Mind” by Tanushree Sharma and Shyamanta Das. The Scientific Update also contained the abstract of a scientific paper, “Study of Psychiatric Disorders in Children and Adolescents to Introduce a Newer Classification System” by Jyotismita Choudhury, Suranjita Mazumdar, Shyamanta Das, Uddip Talukdar, and Kamal Nath. The Souvenir contained an article, “Translational Science in Psychiatry” by Rezib-uz Zaman and Shyamanta Das. Shyamanta Das is the Editor-in-Chief of the Open Journal of Psychiatry & Allied Sciences (OJPAS ). In Horizon, the supplement with The Assam Tribune, dated Friday 16 September 2016, Shyamanta Das, Editor-in-Chief of the Open Journal of Psychiatry & Allied Sciences (OJPAS ) in his Mind Matters column, “Intergenerational epidemiology” wrote about the original research paper, “The role of personality correlates in the pathogenesis of alcoholism: an intergenerational study among alcohol dependent and nondependent population” published in OJPAS . In Horizon, the supplement with The Assam Tribune, dated Friday 2 September 2016, Shyamanta Das, Editor-in-Chief of the Open Journal of Psychiatry & Allied Sciences (OJPAS ) in his Mind Matters column, “A relook at child psychiatry” reviewed the original research paper, “An observational study towards a newer classification in child psychiatry” published advance online in OJPAS . Ricardo Guinea, MD, the President of the World Association for Psychosocial Rehabilitation (WAPR) from Hospital de Día Madrid, C/ Manuel Marañón, 4 – 28043 Madrid, Spain has joined the International Advisory Board of the Open Journal of Psychiatry & Allied Sciences (OJPAS ). In Hoizon, the supplement with The Assam Tribune, dated Friday 19 August 2016, Shyamanta Das, Editor-in-Chief of the Open Journal of Psychiatry & Allied Sciences (OJPAS ) in his Mind Matters column, “Of sexualities and stigmas” reviewed the commentary, “Homosexuality: how therapists can help?” by Mudassir Hassan published in OJPAS . In this week’s Horizon (Friday 5 August 2016), the supplement with The Assam Tribune, Shyamanta Das, Editor-in-Chief of the Open Journal of Psychiatry & Allied Sciences (OJPAS ) in his Mind Matters column, titled “Sexual experience” reviewed the Case Report, “Anubhoothi: a psychopathology of unusual sexual experience” by G Ragesh, Gopalkumar Rakesh, Ameer Hamza, Manoj Kumar Sharma, and Santosh K Chaturvedi that was published in OJPAS . Editor-in-Chief of the Open Journal of Psychiatry & Allied Sciences, Shyamanta Das is included in the 33rd Edition of the Marquis Who’s Who in the World 2016. In today’s Horizon (Friday 22 July 2016), the supplement with The Assam Tribune, Shyamanta Das, Editor-in-Chief of the Open Journal of Psychiatry & Allied Sciences (OJPAS ) in his Mind Matters column, titled “Addicted to ‘world is yours’” reviewed the Case Report, “Methamphetamine: symptoms under the bridge” by Mohit Saini, Senilo Magh, Nishant Ohri, and S Gojendra Singh that is published advance online in OJPAS . Current Issue (July-December 2016, Volume 7 Issue 2) of the Open Journal of Psychiatry & Allied Sciences (OJPAS ) is now in China National Knowledge Infrastructure (CNKI) Scholar. Current Issue (July-December 2016, Volume 7 Issue 2) of the Open Journal of Psychiatry & Allied Sciences (OJPAS ) is now in Google Scholar Citations. Current Issue (July-December 2016, Volume 7 Issue 2) of the Open Journal of Psychiatry & Allied Sciences (OJPAS ) is now in Research Bible (ResearchBib). Current Issue (July-December 2016, Volume 7 Issue 2) of the Open Journal of Psychiatry & Allied Sciences (OJPAS ) is now in DIRECTORY OF OPEN ACCESS JOURNALS (DOAJ). In today’s (Friday 8 July 2016) Horizon, the supplement with The Assam Tribune, Shyamanta Das, Editor-in-Chief of the Open Journal of Psychiatry & Allied Sciences (OJPAS ) in his Mind Matters column, titled “Attitude towards psychiatry” reviewed the Original Research Paper, “Impact of duration of psychiatry rotation on medical interns’ attitude towards psychiatry” published advance online in OJPAS . The Current Issue (July-December 2016, Volume 7 Issue 2) of the Open Journal of Psychiatry & Allied Sciences (OJPAS ) is uploaded in IndianJournals.com. 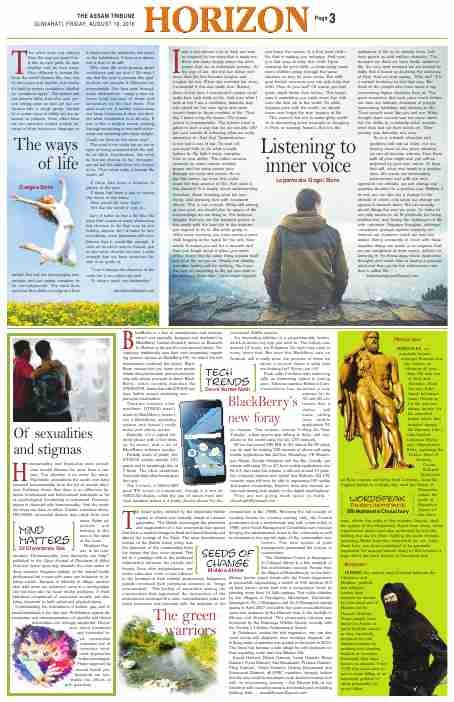 In today’s Horizon (Friday 24 June 2016), the supplement with The Assam Tribune, Shyamanta Das, the Editor-in-Chief of the Open Journal of Psychiatry & Allied Sciences (OJPAS), in his Mind Matters column, titled “Childhood diabetes and behavioural implications”, wrote about the article, “Psychosocial implications of type 1 diabetes mellitus among children in India: an emerging challenge for social work profession” by Jyoti Kakkar and Srishti Puri that is published in OJPAS. In today’s Horizon (Friday 10 June 2016), the supplement with The Assam Tribune, Shyamanta Das, the Editor-in-Chief of the Open Journal of Psychiatry & Allied Sciences, in his Mind Matters column, titled “Autism and EEG”, wrote about the article, “Autism: epileptiform discharge in EEG with and without seizure disorder” by Bobby Hmar that is published advance online in the journal. Attitude towards people with intellectual disabilities (PWID) is mixed and did not follow a particular trend across various studies. PWID are considered to be in need of care always and are not considered to be autonomous individuals and the attitude towards them by the care givers defines their quality of life. History on PWID indicates influence of various psycho-social, biological, religious, and educational factors for the existence of stereotypical attitudes towards them. Keeping this in mind, the chapter of Mythili Hazarika, Deputy Editor of the Open Journal of Psychiatry & Allied Sciences in the book throws insight about attitude towards people with intellectual disabilities in the earliest centuries to the present context by general public, families and parents, siblings and relatives, attitudes towards their education and inclusion in general classrooms and sexuality , and employers, health professionals and media’s role in the same. Hamdani SU, Atif N, Tariq M, Minhas FA, Iqbal Z, Rahman A. Family networks to improve outcomes in children with intellectual and developmental disorders: a qualitative study. Int J Ment Health Syst. 2014;8:7. In Horizon, the supplement of The Assam Tribune, dated Friday 27 May 2016, Shyamanta Das, the Editor-in-Chief of the Open Journal of Psychiatry & Allied Sciences (OJPAS), in his Mind Matters column, titled “Stigma and students”, wrote about the research, “Stigma: knowledge of college going students about mental illness and reaction towards the persons with mental llness” by Sudeshna Basu Mukherjee, Kamlesh Kumar Sahu, and Soma Sahu that was published in Dysphrenia (July-December 2014, Volume 5 Issue 2), renamed Open Journal of Psychiatry & Allied Sciences (OJPAS).